In 1991, 25 years ago, I was able to arrange a ride on the engine of a German ICE high-speed train between Frankfurt am Main and Kassel-Hildesheim to add to my photographic coverage of European railroads. Both the ICE trains and the line were brand new at the time. And both the weather and sun angle early in the morning worked out well. 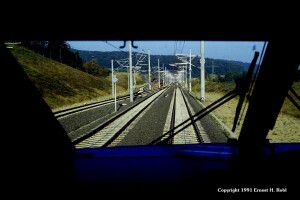 The following images were made from the cab of this ICE 1 train. This photo was made at the end of the trip, after I had detrained during the station stop in Kassel Hildesheim. Note the high platforms at the level of the floor of the passenger cars. 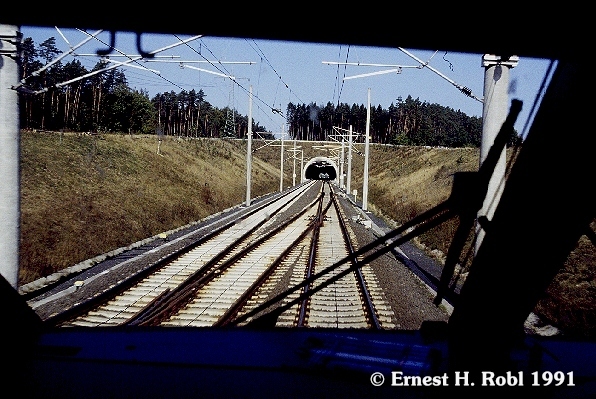 The photos that follow were made mostly on the new dedicated high-speed line and provide a good look at the perfectly manicured infrastructure of German high-speed lines. Legacy: These are historic lines into and out of major cities, with top speeds typically around 100 km/h (60 mph). High-speed trains can operate on these lines without any problem, but due to location and surrounding terrain, there is really no incentive for increasing speeds. Upgraded: (In German, “Ausbaustrecken”) These are existing lines that have been extensively rebuilt to allow appropriately equipped trains to operate at speeds up to about 200 km/h (120 mph). Some non-high speed trains with rolling stock certified for 200 km/h also operate on these lines, and, during off-peak hours, some of these tracks may also be used by fast intermodal freight trains. Dedicated: (In German, “Neubaustrecken”) These are purpose-built high-speed lines signaled for speeds of 250 km/h (about 150 mph) and above. Other than for maintenance and inspection trains, no other trains use these lines. On the legacy and some upgraded lines, the engineer still operates the ICE trains; on the dedicated lines, the trains are operated by communication between an onboard computer and a central dispatching computer via an antenna cable between the rails. In an emergency, the engineer can still override the computer and operate the trains manually — though only at slower speeds. 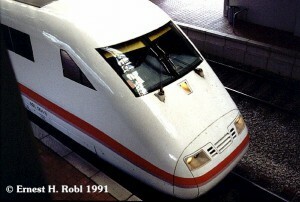 The ICE 1 trains that were built starting in 1989, with a top speed of 280 km/h. use the same catenary voltage as the rest of the German-Austrian rail network, allowing them to operate on most standard lines. A detail-rich image taken while operating at speed on a straight stretch of the dedicated line: (Be sure to click on this image for the much larger version.) Note the connecting track at left with its safety (runaway) track. The connecting track allows work trains to get onto the dedicated line and can also be used to detour trains on or off the dedicated line in case of emergency. Note also the sign at left center indicating that the runaway track does not have catenary and should not be used by equipment with a raised pantograph. Ahead is a set of double cross-overs that allows trains to change tracks and both mainline tracks to access the connecting track. This line has typical ICE heavy catenary, with the catenary masts having two outriggers. Approaching a tunnel on a very gentle curve on the dedicated line. To keep the dedicated lines as straight and level as possible, large portions run on concrete viaducts to cross valleys. (Later ICE lines were built with more substantial grades.) As far as I know, the signs on the catenary pylons indicate a boundary between blocks of the LZB signal system. 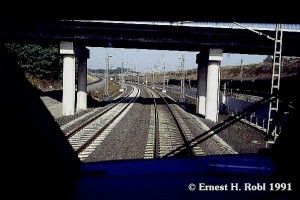 Heading into the tunnel on a substantial concrete viaduct. Again, note the heavy catenary construction. 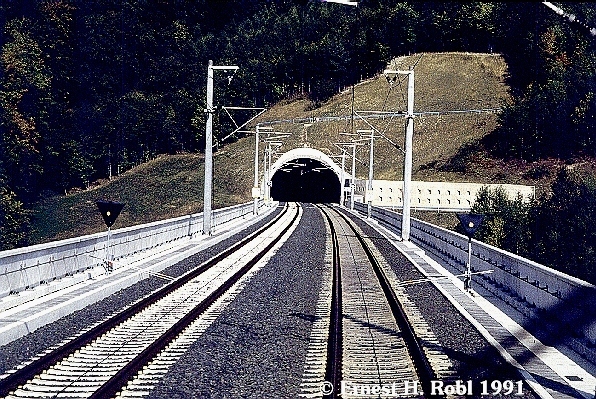 Tunnels on the high-speed lines were built with the NAT (New Austrian Tunneling) method, which uses reinforced concrete. Another look at an NAT tunnel. 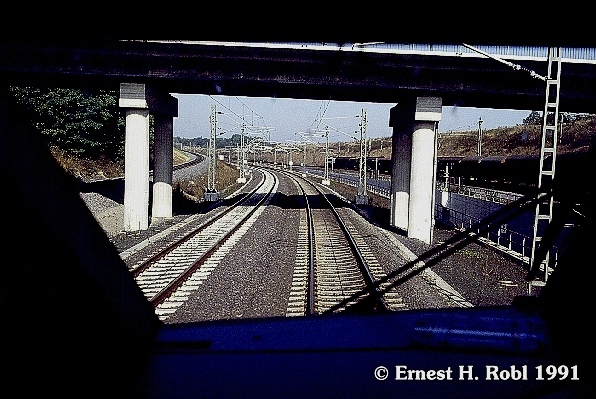 Transitioning to an upgraded line approaching Kassel: Note the more standard catenary masts for this lower-speed section. There’s a freight yard at right and another connecting track to the regular railroad network on the far left. In the years since the trip depicted above, Germany’s ICE network has grown substantially, including into the former East Germany. Several generations of newer equipment, designed for even higher top speeds, have joined the ICE 1 sets. 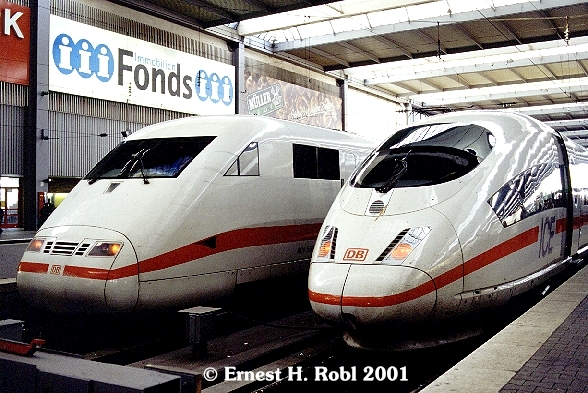 Two generations of ICE trains at Munich Hbf. In 2001 — ten years after the trip depicted above. So, ICE trains, particularly ICE 1 and 2 sets, would be appropriate for any German layout from late Era 4 through the present (Era 6). ICE 1 and 2 sets operate into Austria. 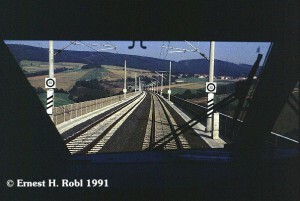 Austria has several newly built line segments (constructed around the beginning of this century) with LZB signal systems. Later generations of ICE equipment also operate into Germany’s other neighbor countries. Because of the pressure-tight connections between cars, ICE sets are not uncoupled except in shops during major maintenance. Many model manufacturers offer ICE models with drawbars rather than couplers between cars. Most major European manufacturers have produced ICE trains in both HO and N scales. Roco has produced many versions of the ICE 1 and ICE 2 in the compressed 1:100 HO length scale, making the ICE 2 trains particularly suitable for layouts with limited space. (Roco has even offered versions with an onboard camera.) Several of these Roco HO versions have been offered with starter sets — typically as only a three-unit ICE 2 train, for which supplemental cars can be purchased. Roco 63087, an HO partial ICE 2 set (in compressed 1:100 length), consisting of an engine, diner, and cab control car. Supplemental matching cars can be purchased to make a more realistic train.) Roco has offered multiple versions over time, making it possible to have two or more ICE 2 sets with different equipment numbers. Makers of scale catenary also offer versions based on the ICE line format — with heavy masts with double outriggers — for depicting a dedicated high-speed line. However, modeling a dedicated line would be problematic, unless you have huge amounts of space. 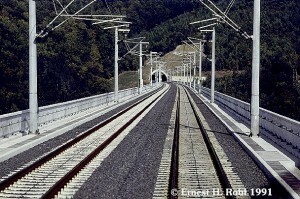 After all, the dedicated lines consist of long stretches of very straight track with extremely gentle curves. And, these dedicated lines only see high-speed trains and work equipment. Of course, ICE train sets can operate on legacy and upgraded tracks, thus fitting in with most modern multi-track mainline operations. Several manufacturers offer NAT (ICE line type) tunnel portals; the modern concrete spans offered by Kibri (in HO, based on an Austrian prototype) would be quite appropriate for building an ICE line viaduct. As with most subjects related to German railroads, there are multiple articles on ICE operations and equipment on the German version of Wikipedia.